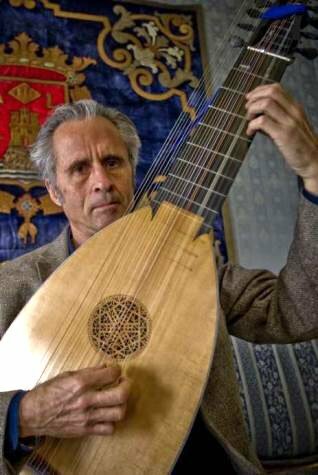 The Cambridge Society for Early Music began its 38th season Monday with Hopkinson Smith on the 8-course lute in a candlelight concert Monday evening at the Christ Church in Cambridge. His Diapason d’Or winning CD “Mad Dog” of Elizabethan music highlights golden age of English lute music during the reign of Queen Elizabeth I, from the sprightly and humorous to the deeply sorrowful. Smith followed with Fantasias 5 & 6 by John Dowland which he then joined Mrs. White’s Nothing in-between. What struck me the most was Giacometti’s quote — “All art is created for nothing.” — with which the performer introduced this grouping. Just as he began, came a second surprise: the blowing noise of the church’s heating system which nearly wiped out the sound of this fragile voice of antiquity. To listeners who were willing to lean in even more and focus on free-flowing, delightful interpretations of Fantasias, Hopkinson would deliver the deep expression using the lute’s harmonies to underline melancholic emotions. Byrd’s Pavana Bray, originally written for the harpsichord as is all Byrd’s lute repertoire, offered quite a delight with a warm string of diminutions [defined as the proportional shortening of the value of individual note-shapes in mensural notation, either by coloration or by a sign of proportion]. The Shoemaker’s Wife started out as a rhapsodic Pavan with an independent melodic line converging in harmony, but maintained linearity. It moved towards a contrasting texture, but instead of technical fireworks we heard contrapuntal subtlety. Renaissance lute in Hopkinson’s hands became transparent as if a human voice directly conveyed that nuanced emotional message. From John Johnson, one of Elizabeth’s royal lutenists, and one of the most important English Renaissance performers and composers for the instrument, came Johnson’s Jewell and a set of variations on The Carman’s Whistle. Carmen, or carters, whistled to their horses and so developed a reputation as musicians. This risqué song detailed the story of a maiden as beautiful as Venus who sat all alone beneath a mulberry tree lamenting her maidenhood, when a lively young carman happened by and astonished her with his whistle. I felt privileged to witness such timeless intimacy with a glorious past. Charming, yet surprisingly melancholic at times, the tactful transcriptions turned this evening into a pleasantly substantial journey through the era of the first Queen Elizabeth! I was fortunate to attend two of Hopkinson Smith’s performances of this program – Weston and Carlisle. I have listened to Hoppy’s playing for years and have always been uplifted by his generous spirit and playing that is infused with a deep sensitivity. When listening to Hoppy play Elizabethan music we hear the expression of pretty much an entire life spent with this music. Let’s not forget all of the other composers whose music Mr. Smith has performed and recorded over the years. Hoppy was my teacher at the Longy School in the early 1970’s and his teaching has informed my life.